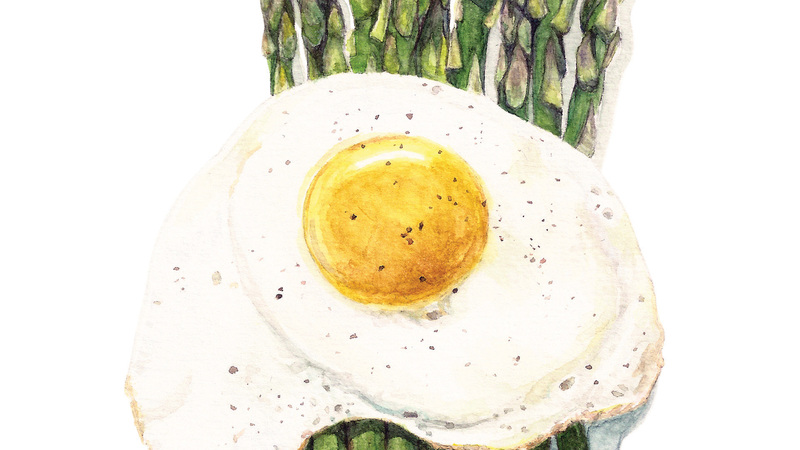 When I start seeing asparagus in a farmers’ market, that’s when I know spring has begun. My quintessential springtime vision would be a dish of bright green stalks, sautéed in butter with a sunny-side egg on top. A simple, but rich recipe to celebrate the end of winter. 1. Clean the asparagus and cut off the bottom 1-2 inches of the stem, which can be hard and chewy when cooked. 2. Heat a large skillet with 2 tablespoons of butter over medium-high heat and add the asparagus. Season with salt and pepper and cook for 5-8 minutes, or until the asparagus is tender but crisp. (Be sure to toss every minute so all the sides are cooked evenly). 3. Remove from heat and squeeze the juice of a lemon wedge over the asparagus and cover to keep warm while you fry the eggs. 4. Coat a frying pan with a little butter or olive oil over medium-high heat. Gently crack the eggs so the yolks are not broken, and spaced out so the eggs don’t touch. Once the whites have set, reduce the heat to low and cover. Cook yolk to desired runniness. 5. To plate, place spears evenly and facing the same direction, add the egg on top and season with salt and pepper.